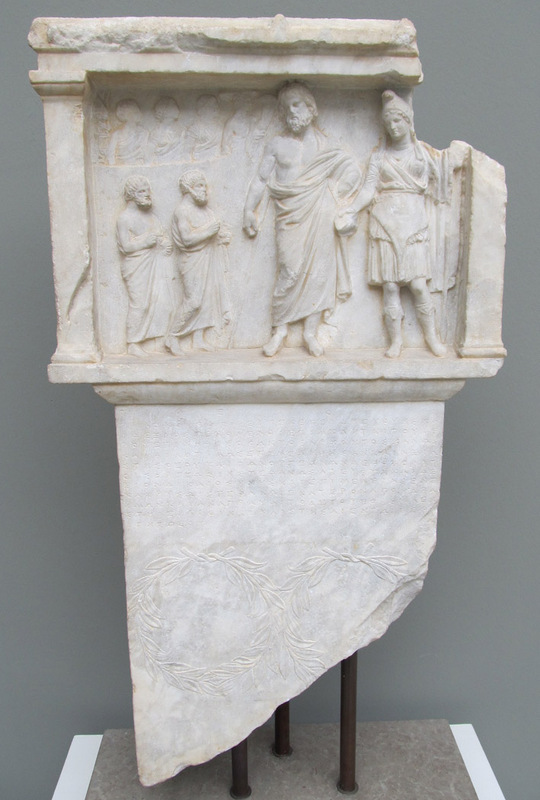 Slab of Pentelic marble with a rectangular plaque (pinax) at the top of a shaft containing the inscription, now in Ny Carlsberg Glyptothek, Copenhagen (inv. 1043a). The relief (see photo in figure 2) depicts the goddess Bendis on the right, wearing a Phrygian cap and dressed in an animal skin with a spear in her left hand and a bowl or plate extended in the right hand. The other figure is likely Deloptes, her consort. Two bearded male worshipers appear at the left, probably representing the two honorees. In the upper left corner there are five smaller figures carved in low relief. There are two olive wreaths on the shaft below the inscription. 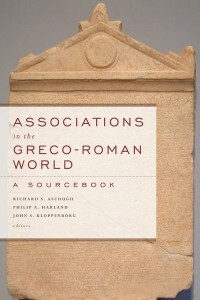 It is not clear whether the membership of this association consists of Athenian citizens or Thracians (possibly slaves). Gods! Philokrates proposed the following motion: Whereas Euphyes and Dexios, who were supervisors (epimelētai) of the sanctuary during the year that Kephisophon was civic leader (archōn), performed their service honorably and with ambition and in a manner worthy of the goddess and of the sacrificing associates (orgeōnes), the sacrificing associates have resolved to crown Euphyes and Dexios on account of their honesty and care, each with a gold crown worth 100 drachmas, and to inscribe this decree on a monument (stele) and to set it up in the sanctuary of the goddess. IG II² 1256 = AGRW 12: Relief with Bendis and Deloptes. Two worshippers approach with members of the association depicted above.